Few of us can tackle our health issues alone. Download the first 3 chapters of my new, bestselling book, Bloom, for FREE and start on your path to transformative mind-body healing. reclaim your health and wholeness today. 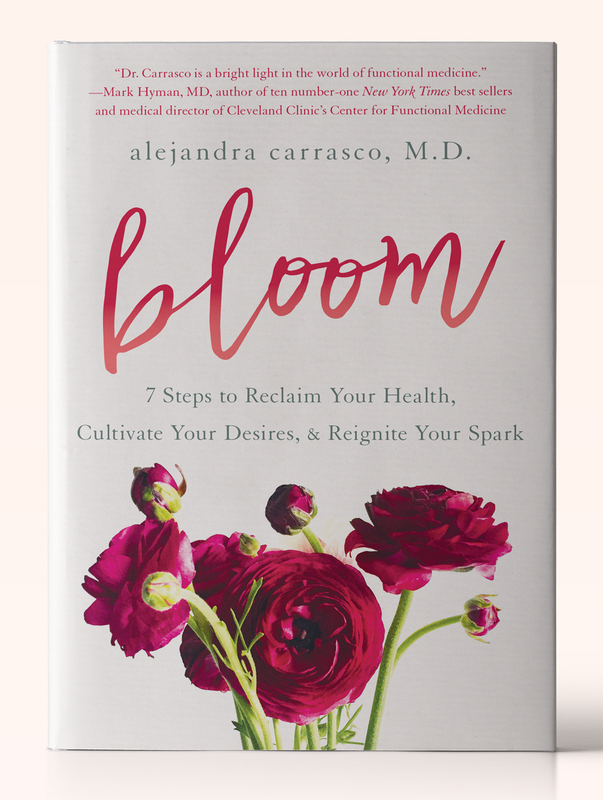 “In Bloom, Dr. Carrasco has outlined exactly what it takes for women to overcome modern health challenges while nurturing a conscious attitude of growth, self-care, and compassion." “This book will inspire you to cultivate the garden of your health in an actionable, science-based 7-step process that is simple to implement. 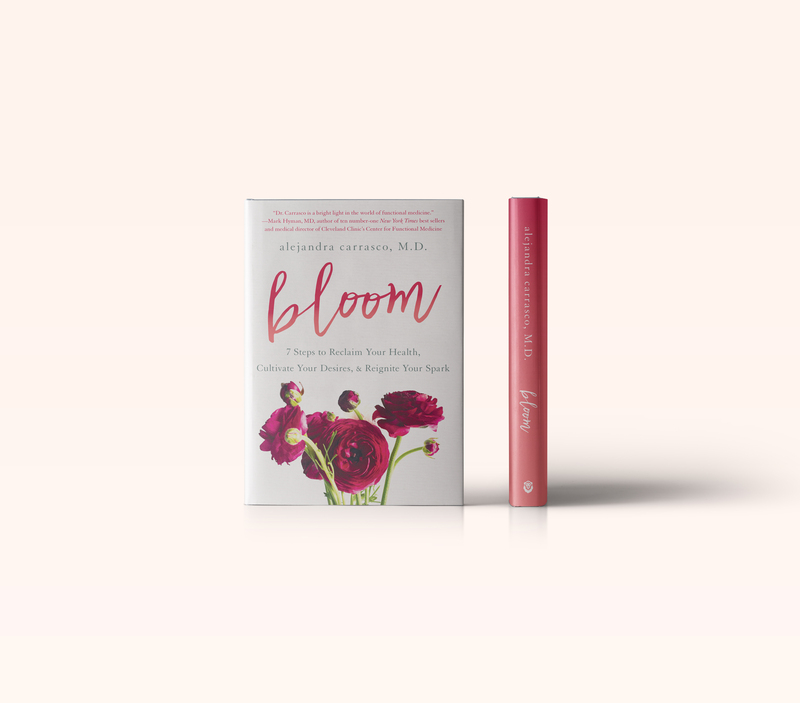 Dr. Alex leaves no stone unturned as she compassionately shows readers how to “rebloom” with a life-enhancing, total body, mind, and spiritual transformation. This book is a must-read for any woman seeking to reignite her inner spark." 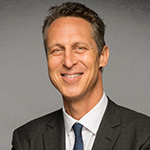 “Dr. Alex invites you to explore your infinite potential as a woman! 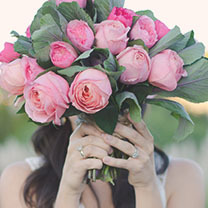 Bloom gives women proven and effective strategies to create amazing energy, resiliency to life’s stress, and tools to raise the vibrancy of their spirit to truly flourish"
Recent statistics have revealed a disturbing trend in women’s health; with autoimmune conditions, thyroid disorders, infertility, heart disease, cancer, insomnia, and mental health disorders afflicting a record-number of young women. How can this be when women have been shown to take such good care of themselves? 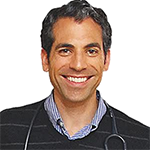 The truth is, despite our best intentions to follow the latest nutritional advice, exercise, and getting our yearly checkups, modern medicine is failing us… miserably. reclaim your health & wholeness. In Bloom, Alejandra Carrasco, M.D. 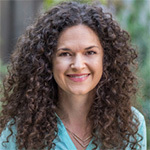 and certified functional medicine physician, guides you through her individualized 7-step process to reclaiming your health, uncovering your desires, and reigniting your spark. The answer to our modern women’s health crisis doesn’t lie in another seven-day detox cleanse or quick-fix diet, but in an authentic quest to uncover our deepest desires for health, life, and purpose. Only then can the powerful seeds of true health take root, flourish, and bloom. 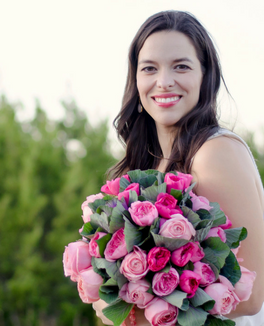 You can live your life in full BLOOM—healthy, rejuvenated, and filled with joy—Dr. Alex shows you how. Do you have a copy of Bloom? Click below to access a wealth of resources, downloads, and information organized chapter by chapter.